Ganesha is hailed as a remover of obstacles and a harbinger of success. 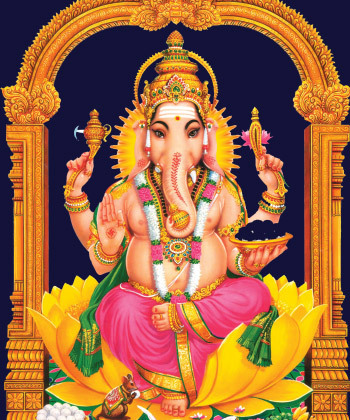 He is ‘the God of good luck’ and a symbol of auspiciousness, and is known in many other names such as Ganapati, Vigneshewara, Vinayaka and Pillayar. 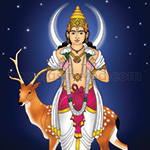 He is the divine son of Lord Shiva and Goddess Parvati, and remains a unique divinity, with a human body and elephant head. He is celebrated as a hero of strength, as a happy dancer, as a sweet child and as many more, and is both loved and revered. It is a widely practiced custom in our land to offer prayers to Ganesha and seek his blessings before starting any endeavor or undertaking any venture or making a new beginning. 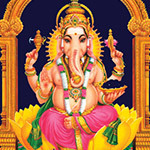 Ganesha veneration is being done from very ancient times, and Gaanapathyam, the Ganapati worship, has been established by saint Adi Shankara, as one of the six fundamental forms of worship in Hindu religion. Ganesha is a deity who is remembered with respect and gratitude by his devotees at every moment of their lives, while ceremonial worships are also offered to him on special occasions. 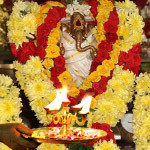 Ganesha Pooja is one such unique worship dedicated to this compassionate God, which can earn for the devotees his blessings in the form of many benefits. Ganesha is a God who should be worshipped by people belonging to all sections of the society and prayed to for getting relieved from all types of problems and for the fulfillment of all kinds of honest desires. However Ganesha essentially remains as the destroyer of obstacles, and hence his worship should positively be performed for clearance of impediments- like ailments, losses, setbacks, ill-luck, etc. 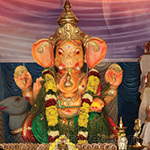 Ganesha Pooja is thus ideally recommended for overcoming roadblocks and for traveling in the path of success in life. 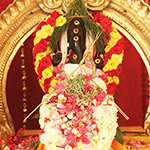 The incarnation of Lord Ganesha is believed to have happened on the Chaturthi thithi in the month of Bhadrapada, which corresponds to the Tamil month Aavani (August-September). This sacred occasion is celebrated with enthusiasm as Ganesh Chaturthi. As the Lord's advent took place on a Chaturthi, the fourth lunar day, this day is held as very special for worshipping Ganesha. 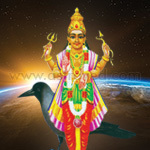 So, any Chaturthi is considered as highly suitable for doing Ganesha Pooja. The benefits that can accrue on the performance of Ganesha Pooja can cover all the significant aspects of life. 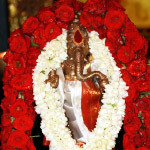 By the divine grace of Lord Ganesha, this can cure diseases and restore good health; remove impediments and help achieve targets and goals; help in bright job prospects, career advancements and successful business ventures; curtail losses and improve financial conditions; improve children education, family welfare and prosperity; help to develop strong bonding with near and dear ones; and bestow one with peace and joy. 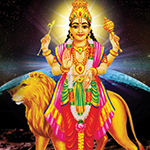 This mantra invokes the great lord, offers salutations to him and seeks his compassionate blessings for the devotees. People recite this during the Ganesha pooja and pray to Ganapati for their welfare. This Ganesha Pooja performed for 3 months, once a month, invokes the blessings of Lord Ganesha, who is considered the ‘God of Luck.’ Performing special Pooja for Ganesha can remove all your obstacles, achieve your goals, cure health issues, and gain success in all endeavors. This Ganesha Pooja performed for 6 months, once a month, invokes the blessings of Lord Ganesha, who is considered the ‘God of Luck.’ Performing special Pooja for Ganesha can remove all your obstacles, achieve your goals, cure health issues, and gain success in all endeavors. This Ganesha Pooja performed for 12 months, once a month, invokes the blessings of Lord Ganesha, who is considered the ‘God of Luck.’ Performing special Pooja for Ganesha can remove all your obstacles, achieve your goals, cure health issues, and gain success in all endeavors.